This evocative, musically rich performance draws from Kalevala, Finland’s national epic, based on folk poems that were sung across Finland, Estonia and Karelia (Russia) for centuries. While publication of the text was instrumental to Finnish national identity, this performance returns the story and music to their oral, varied roots. It’s so exciting to move between music, poetry, songs, spells and stories, combining this hugely rich history with invention and inspiration. This original show is created and performed by the UK’s leading Kalevala storyteller and Adverse Camber’s most longstanding artist partner, Nick Hennessey and three of Finland’s leading folk musicians, all of whom are academics at the Sibelius Academy in Helsinki – Kristiina Ilmonen (percussion, flutes, vocals), Anna-Kaisa Liedes (singer) and Timo Väänänen (kantele, pyngyr, vocals). Fire in the North Sky is a collection of stories and episodes which, combined with beautiful and evocative music, take us on a journey through the Finnish landscape alongside magnificent adventures, uncovering great human emotion and dramas, amidst a sea of rich characters. It gives you the authentic flavour of the ancient epic as well as modern, lively interpretations of the characters, stories and songs. Fire in the North Sky is a bold, original show, which toured for the first time across the UK in 2015, it presents a rare opportunity to experience authentic Kalevala stories in English and a ‘contemporary ancient’ style of folk music, which is quirky, beautiful and uniquely atmospheric. FINS is guaranteed to be unlike anything you have experienced before. 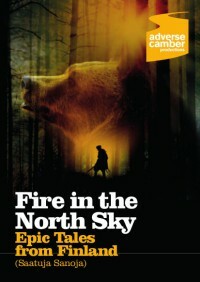 Read more in the Fire in the North Sky A6 programme.